The Royal Canadian Mint has combined two of its most popular coin programs into one amazing product with the release of reverse proof Silver Canadian Maple Leaf coins featuring privy marks from the popular Canadian Wildlife Series. Right now, the 2017 Cougar Privy Silver Canadian Maple Leaf Reverse Proof is available as a perfect specimen on Silver.com. Total coin mintage limited to 50,000 coins only! Third release overall and first of 2017 in the Wild Canada Series! Bears a face value of $5 (CAD) backed by the federal government of Canada. Issued a grade of PF70 by the Numismatic Guaranty Corporation. Designated an Early Release coin. Queen Elizabeth II’s portrait on the obverse. Sugar Maple Leaf and Cougar Privy on the reverse. Wild Canada is a new six-coin series from the Royal Canadian Mint with extremely limited mintage figures. The series features two new releases each year, starting with the wolf and grizzly bear (in order) in 2016. The cougar is the first of 2017, and only a select few coins from the low mintage of 50,000 earned this certification. 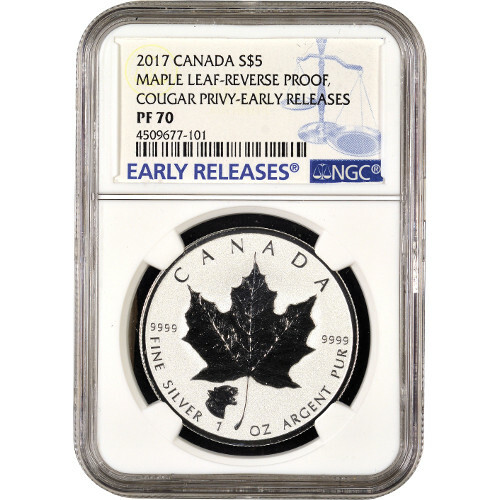 The 2017 Cougar Privy Silver Canadian Maple Leaf Coins in this listing are PF70 certified by the NGC. Coins with this grade exhibit full, original mint luster and bear no detracting flaws of any kind on the surfaces. 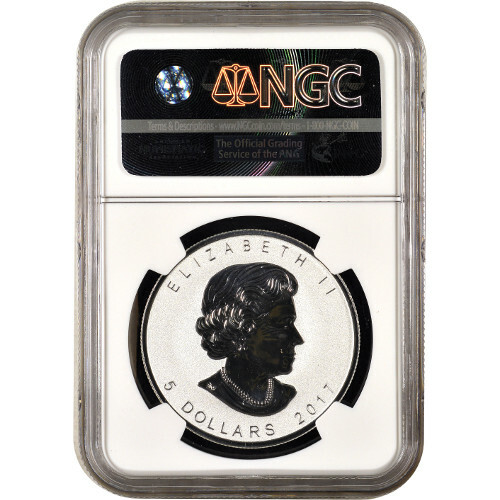 The Early Release designation is for those coins received for certification by the NGC within the first 30 days of the release date set by the Royal Canadian Mint. On the obverse of each Silver Canadian Maple Leaf coin is a right-profile portrait of Queen Elizabeth II. Her Majesty appears on the obverse of all Canadian coinage, and has done so since ascending to the throne of England in 1952. The reverse of the 2017 Cougar Privy Silver Canadian Maple Leaf Reverse Proof coins features the sugar maple leaf design in the center, with a small cougar privy mark located to the lower left. These coins have a reverse proof finish that gives them a unique beauty. While standard proof coins have mirrored backgrounds and a frosted finish to the design sets, these 2017 Cougar Privy Silver Canadian Maple Leaf coins have a reverse proof finish. This means the background field features the strong, frosted finish while the designs have a clear, mirrored appearance. The Royal Canadian Mint is the nation’s official sovereign mint, and it operates from its original headquarters in Ottawa, where it opened in 1908. A second facility was opened in Winnipeg in 1980 to expand the capacity of the mint. If you have any questions, please feel free to ask. Silver.com customer service associates are available at 888-989-7223, online using our live web chat, and via our email address.